Animax, an international anime channel owned by Sony Pictures Television arrived to India around two years ago. And since then, it has truly been a challenge for the channel to carve a niche for itself in a land that probably relates more to daily soaps and prefers shedding bucketful of tears on the saas-bahi sagas. Animax as a channel basically dealt with airing animes. Keeping the nerve of the youth in mind, Animax India repositioned itself in June 2006, to establish itself as a channel that does not merely offer animes, but offers animes which ‘make sense’. With an intention of extending its reach to young kids and to the Indian youth of upto 20 years of age, Animax aires animes that have serious content, sensible plot-lines and basically transcribe themselves as mature dramatic series rather than the typical cartoonish stuff. 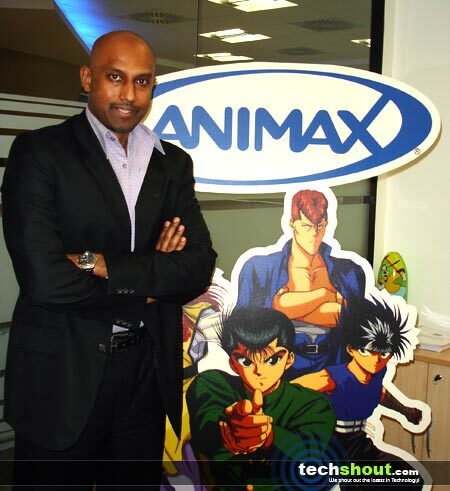 TechShout.com had an exclusive interview with Mr. Sunder Aaron, Country Head of Animax, where he spoke about the why Animax may NEVER adopt hindi for its programs, what the company’s future plans are and much more. Read on, to know more. A common perplexity is the thin, or perhaps the major difference between animes and cartoons. Speaking about this, Aaron stated that firstly it’s best to refer to anime as animation, since animation is a term people relate to quite well. Coming to the difference between the two, anime consists of visual characteristics with which everybody can identify with very quickly. The story lines are more sensible and the themes are more mature. Animes have real dramatic conflicts as against cartoons, which often have people jumping off the building and bouncing and displaying antics to that context. However in anime, it’s all about the story. That is the profound difference between anime and cartoon. Speaking about the viewership of Animax in India, he surely seemed ecstatic. The channel’s target audience is anything between 15 to 24 year olds. However, interestingly its popularity amongst the older age group has been also escalating recently. Infact, Animax is not only in cut-throat competitions with other big English entertainment channels in India, but outbeats them on several occasions too. So that speaks best about its popularity and about the fervor that the audiences have towards the channel. The audience- grippers according to Mr. Aaron are Fullmetal Alchemist, Inu Yasha, Ghost Block are the animes doing extremely well on the channel. Even the movie block called ‘Aniflix’ is performing superbly. Mr. Aaron told us that the next big anime series to hit Animax is ‘Initial D’ – a racing animation series, pretty much on the lines of The Fast and the Furious: Tokyo Drift (2006). It basically revolves around Illegal Mountain driving. Reruns, reruns and more reruns on Animax. We couldn’t help but ask Mr. Aaron, the reason for the same. Commenting on this, Mr. Aaron said, “We surely are in the moves of getting fresh programming, which we want to save for the night primetimes. For instance, one anime series that’s been on Animax for quite sometime is ‘Flame of Recca,’ ‘Monkey Typhoon’ which have several episodes, re-running in the afternoon.” He added, repetition is pretty typical, and with respect to programming in animation channels it is one of the most conventional ways. Re-runs or repetition of shows is surely something that interests Animax’s early teenage audience. Infact, very often the ratings too tend to rise with re-runs airing on the channel. But the channel is surely focusing on getting some brand new exciting stuff soon on the channel. When asked if Animax India too plans to go the Cartoon Network way, and dub its shows in Hindi, Mr. Aaron stated that at one point of time a part of the channel was broadcasted in the Hindi language, which somewhere ended up confusing the viewers and ended up squeezing off the charm from the show. After speaking to several Animax fans, through the channel’s websites and forums, it was easy to decipher that they were largely not keen on watching the Hindi dubbed shows. With response to all this, the channel’s current focus would be the metros of India, which are extremely comfortable and relate well to shows in English. And as the channel continues to develop, Animax will take a stand on whether it plans to dub its shows in Hindi and offer a feed in the language for the rest of India. Anime and animation per se has come a long way in India. At one point of time, India didn’t go beyond the limitations of just rendering the art work and its sorts for an animation series. However today, not only has India excelled in the general know-how of the animation spectrum but has also extended its grips to the various technologies and technicalities involves in the development of animations. We asked Mr. Aaron about where Asian countries, particularly India stands in the animation foray and what according to him is the future of anime in India.3. First and foremost Mr. Aaron was quick to point out that the interest is surely growing. Mr. Aaron added that the growing craze for Animax is a perfect example of how audiences have begun to get glued to these kinds of shows. He further continued that there are anime shows such as Dragon Ball Z on Cartoon Network and various other animation shows on several other channels are doing extremely well too. And it doesn’t end here. We further spoke to Mr. Aaron about the Animax Grand Gaming Challenge 2007, too. Stay glued on to know what he had to say about the contest, about gaming in India, and much more, coming on TechShout.com soon.